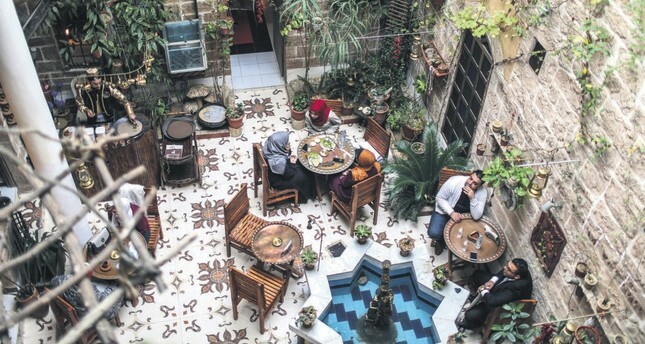 A restaurant named Bait Sitty opened in a 430-year-old Ottoman building in Gaza. It is expected that the restaurant, which has opened in one of the most beautiful examples of Ottoman architecture in Al-Zaytoun neighborhood, will attract the attention of tourists. The building, the historical structure of which was protected during the decoration, houses an inner court with an ornamental pool and well in the middle along with a guest room near the entrance where people are hosted. A large, high-ceiling room, which is used as a kitchen, dining rooms and a library with many books, are located downstairs. The rooms upstairs have also been prepared in a way for the visitors to have a nice time and enjoy their meals. Speaking to Anadolu Agency (AA), Atıf Selame said that the building where the restaurant is located is one of the important historical places in Gaza. Noting this Ottoman house is 430 years old, Selame added that the restaurant is the first to have open in this historical building. "We give a message to protect the history of Palestine. We hope the authorities in Gaza will pay special attention to places with rooted history," said Selame. One of the customers, Visam Yasin stated their happiness with the opening of such a restaurant here. Saying this restaurant has a different flavor, even if there are many restaurants in Gaza, Yasin continued, "This place brings us back to the old times." According to the data of Palestinian Ministry of Tourism and Historical Works, there are 134 buildings which are more than 180-years-old in Gaza.